1 Rage, 1 Healing, 1 Jump, 2 Freeze. For lower th levels rage/healing tends to be the best. More healing if you need to keep up with defenses, more rage if your healers can easily handel the job. Though very similar to the traditional Giant/Healer combination the addition of Valkyrie has certain advantages. Namely you can afford, damage wise, to bring 4 healers. This means they can get split up if need be. Valkyrie also make a great compliment to healers as well. I personally recommend 2 healers unless you are trying to tackle defenses that are outpacing your healers, unless infernos are in the mix. If you do run 4 healers, pack more rage spells to compensate for lack of DPS. Because of this their are 3 types of Air Defense coverage that are weak verses this combination. The traditional type where one is exposed and the others are spread out. The next being in a line, Valkyrie are great at rushing ahead and taking these out. And finally heavily centralized Air Defenses. This man seem contrary but since you have Valkyrie along the Giants can function much like golems do for GoViz, GoWiVa, and GoVaPe. As long as they are distracting defenses and taking fire, they are getting the job done. This means if I can get my giants in, and have them distract defenses along an edge - I will. The giants occupy perimeter defenses, and Valkyrie go for the heart. After running this combination many times, luring is not necessary. Now in war I never turn down an easy lure. If you can easily lure, its safer to do so. But if you are not luring you must know how to use Valkyrie to eliminate the CC quickly. Also you must do your best to pull that CC in a line, so they are somewhat bunched up. Throw a rage/heal/jump in the mix and generally the CC goes down quickly. At the th10 level I have found that the addition of the golem leading the pack frees you up to add a healing, and with all 4 spell types at your disposal its not difficult to overcome enemy CC. This is also the primary reason to use Valkyrie over other units. If up against a Th10 you need to carefully consider your combination of troops. If up against premature defenses Giants and healers will generally perform very well. If the point defenses are maxed, then you’ll need the addition of a golem to provide extra flexibility and tanking. If the wall levels are high, you will also need more wall breakers. Giants do just fine against low level walls and a healer behind, and I often just let them break down the wall. But if up against high level defenses with lava walls and higher, it will simply take them too long to do this. At lower Th levels a few well timed wallbreakers will generally weaken maxed walls enough that giants can dish out the last few points of damage. In short, you be frugal with WB usage. You want to see defenses spread out and in particular non-defensive buildings mixed in between those defenses. Heavily concentrated defenses may overcome a healers effects while more spread out defensive fire allows heals time to keep the giants going. Also lots of trash buildings can be very distracting for your Valkyrie if outside of the base. The core of the base is best if dense or tightly packed, in particular if it has a large collection of buildings in it. Valkyrie can make quick work of these types of core and often the giants and healers can then easily pick off the rest of the base. Other than that you want bases that allow you to keep your giants in front and taking fire. This combination fizzles quick if your wizards (and or witches) get taken out. The Valkyrie can save it from a complete loss but a major component to this strategy is the giants soaking up damage like sponges. I wanted to make a special note here. To be useful a healer need not survive the battle, she only needs to prolong the life of your units. One characteristic of my own attacks is deploying her almost immediately. This serves several purposes. The 1st is that it prevents her AI from healing a unit I do not want her to. A healer will target the closest unit to her that has taken damage. This means if you wait to deploy her until an AD is down, she may go for your ranged units instead - or a hero. Giants are slow and generally deployed in a pack (the more housing space a healer is healing, the less likely she will break from her original target), a healer will generally stick with them until they either get substantially thinned out or die all together. The second is that it allows me to make use of her healing immediately. Its much easier to insure her survival in the early parts of the fight, than later. So if she goes down after surging the core, but has kept your giants at full health - she will have been effective. For this reason, I visually cut a base into sections covered by Air Defenses and Infernos. If there is a gap in coverage, its generally the best place to use your giants. When dealing with a full array of defenses it can often be more practical to attack a location that is simply not well protected rather than always aiming to take out an Air Defense first. In fact, I rarely use my giants/healers near an Air Defense. I just wanted to note here that giants actually have an advantage over golems in some ways. Giants have more DPS and when used with a healer can have infinite life. Their just a bit faster and since you use them in groups, single target infernos don’t do well against them and you do have the option of overwhelming infernos with their numbers - particularly ones that are not maxed out. The major advantage is they are less likely to send a whole raid hitting a wall. So I am revising this section of the guide. Though this is the oldest strategy to utilize Valkyrie effectively it has also changed dramatically. With the Valkyrie AI change and the healer buff (no air mines to worry about) this strategy gained allot of extra power. I am going to break the primary strategies of this composition into 1, 2 and 3 point attacks. In any given attack method you want to carefully consider the Air Defense coverage. You only need to identify gaps or areas where taking just one more exposed AD out will create one. At Th10 you must also consider disco infernos, which are better if firmly tucked deep inside the base. I’ve described it in more detail in my GoViz section, but Valkyrie do best with a runway. A somewhat confined direct path to the core. Too much side to side action causes them to whiff attacks something terrible. This is probably the most traditional method of using giants and healers. Attack at a location near an Air Defense. Use a heal spell if needed but take out the Air Defense quickly. Then place both healers behind your giants. If using 4 healers, you can use the other healers on your Valkyrie or put a 3rd on your giants and keep the 4th as backup. Since you are concentrating your attack you can begin with your giants somewhat spread out with a few out front to sniff for spring traps. Keep a larger portion clumped to ensure they will attract the healer. You want to carefully deploy your wizards in a one point attack. Use them to clean up garbage buildings to keep your Valkyrie on target, and deploy carefully behind your giants. Losing too many wizards is a recipe for failure as they are the major damage components to your attack. In a one point attack you must carefully clear a path for the Valkyrie. Since you only have 1 point of entry its very important to have all distracting buildings taken care of. This means you may need to spare a few giants and wizards for this. Failure to do this will likely cause your Valkyrie to dash off which could be disastrous if you need them for CC, heros, or just to clear out the core. In a one-point attack you may need to lure, depending on if you can set up the attack so Valkyrie meet the CC, not your giants. With Valkyrie two-point attacks are much more effective than one. You can clear more outside buildings and make a better path for the Valkyrie. It basically turns the Valkyrie into the Golems in a GoViz attack. If you haven’t figured it out, a 2-point attack attacks 2 points. In the center of a typically 2-point attack is an Air Defense that once destroyed creates a large pocket. In this strategy you deploy healers immediately behind the giants because your giants aren’t going to take out the AD, your Valkyrie are. Your giants need only keep defenses occupied and if the walls are low enough in level you may not need to bother with wall breakers. Since you attack at 2 points, you can leave buildings standing where you want your Valkyrie to attack. This is the most effective pathing strategy I know, as it eliminates needing to worry about if you cleared a building that is 8 paces off target that is technically closer. A 2 point attack is very effective at dealing with the CC inside the base. At Th8 save a heal/rage for this and at Th9 add a jump spell in the mix (may not need both heal/rage). If you attack opposite the CC, often you can use it to get your Valkyrie deep in the core and causing havoc. This is my bread and butter tactic when using Giant/Healer. For those of you not Valkyrie fans, hogs can also function in this role but will require lurning. This has become my Th10 variation on this strategy but should be extremely effective at Th9 as well. I am not sure if Th8 has the housing space for it. To do this strategy you need a Golem, you can technically do a 3-point with a 3rd healer but a golem is more effective as it lets you press part of your attack on an AD without worrying about keeping your healer alive. This attack is similar to a 2-point but the golem occupies (typically) a center point of the attack. 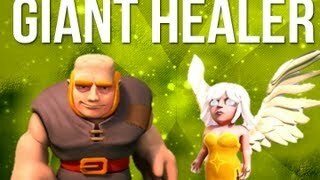 I usually deploy my giants first with healers unless defenses are very concentrated and high level. I do this because it takes the heat off my golem, who will lead the attack on the core. I also do it because healers get harder and harder to keep alive as a battle progresses. Since I have 3 points its not difficult to clear all the outside buildings at a particular location. The only stipulation is that you must make sure you clear ALL buildings that are a distraction before deploying Valkyrie. It really reduces the effectiveness of this attack if Valkyrie go somewhere besides the core, its not a complete loss all the time but it makes things hard. Again the Golem leads the attack on a critical AD. This attack is particularly effective at dealing with CC inside a base and allows me to bring a heal spell along since my overall tanking ability is high enough to even sustain maxed defense damage long enough to capitalize on a heal. The golem soaks up damage and effectively gets the CC to bunch up if in the lead. Add in the rage/heal/jump and the core generally doesn’t have a chance as long as you properly set up the Valkyrie to beeline towards it. In pushing or regular raiding you can switch to a 2-point attack with a composition made for 3 or even a 1 point. You just need to divide up the giants accordingly. Put a few with the golem. They help it to destroy defenses and make the healer more effective than on its own. This is not a staple technique but a base exploit that occasionally comes in handy. Some bases have large blind spots in AD coverage. If you stick to the outside of the base you can severely cripple the base while your giants receive infinite healing. It just requires you to attack in a way that is very abnormal. Most attacks are more direct, this technique requires you to actually attack a side of a base and move along it. If you’ve identified a section of the base that has no Air Defense coverage or a whole ring. Deploy your giants and place 2 healers behind. Deploy at the corner of a compartment so that giants move along the edge of the base, periodically deploying wallbreakers to keep them doing this. Keep a few giants in reserve to clear a necessary building if need be. Use only a handful of wizards to clear buildings. Your intention is to let the giants clear as many defenses in the blind spot as possible and since you are moving them in a sideways or looping fashion they may not effectively protect your wizards who will move to attack the center of the base eventually. Once you’ve exploited the blind spot, clear a few necessary buildings and have your Valkyrie gut the core. If possible take out Air Defenses to prolong the exploit. This is a surgical style attack and requires you to think about unit AI and behavior. But when a base comes along that this works on, it is fun to capitalize type of attack. If you can visualize the weaknesses of a base this is a very effective composition for storage farming, pushing, and perhaps even war. I’ve used it a few times now for war after figuring out the 3-point attack and can take on maxed Th10 defenses with it. I am still new to this variation but feel its comparable to a GoWi attack with 3 Golems. If there are Air Defense coverage gaps I think it is sometimes more effective at tanking and guaranteeing a high % damage. However, eventually Air Defense will take out the giants and if you're up against maxed defenses they won’t last long without healing. DISCLAIMER: Killing the CC inside a base requires some practice and skill. I recommend using GoViz first to practice this as you bring 14 Valkyrie to the table and they can do it with a margin of forgiveness. As little as 5 Valkyrie if well deployed can quickly destroy a core with CC troops but the fewer Valkyrie you use the more precision is require to accomplish this task. So if just learning this strategy, lure to allow your self some learning time. You have explained paper writing pro services updates so well. I have earned 100 coins from one point attack. This is really unbelievable for me and also my friends didn’t believe it. I have earned it and so happy with this. It could be just the way we can have the free house of fun coins online when we want to generate the coins from the house of fun generator here.